Measuring ground features in imagery, called "image mensuration", is an important function in many image interpretation or feature compilation applications. Image mensuration is defined as applying geometric rules to determine distance, area of a 2-dimensional or 3-dimensional surfaces using the information obtained from lines and angles. It also includes measuring the height and absolute location of a feature. Imagery from modern sensors contains important metadata determining the location and attitude (roll, pitch, and yaw) of the sensor platform when the image is collected. Using this information, georeferenced imagery can be used to provide measurements. Measurements can also be collected using imagery displayed in image space rather than map space. These include basic measurements such as distance or area. Additionally, height measurements can be obtained when a sensor model exists, and measurements using shadows visible in the image can be determined using sun angle information. All measurements can be refined for more accurate results using DEM data to account for terrain effects. ArcGIS Pro provides a set of tools for image mensuration, including tools to measure distance, point location, angle, height, perimeter, area, and centroid of area from georeferenced raster and mosaic datasets with sensor information. Measurements can be recorded in the Mensuration Results pane and are saved with the project. Point—Determines the location of point-based geographic coordinates. Distance—Measures the distance between two or more points. When there are multiple vertices within a line, the cumulative distance of the polyline is measured. Area—Calculates the size and perimeter of an interactively drawn polygon defining an area of interest. Centroid—Determines the centroid of the area of interest defined by an interactively drawn polygon. 3D Point—Measures the location of a point along with its elevation. 3D Distance tool—Measures the distance between two or more points while incorporating an elevation surface. 3D Area—Calculates the size and perimeter of an area while incorporating an elevation surface. 3D Centroid—Calculates the centroid location of an area while incorporating an elevation surface. When an elevation dataset is defined in the Mensuration Options pane, it will use a DEM to refine the calculations for all the measurement types. Base To Top Height—Calculates the height of a ground feature by measuring from the base of the object to the top of the object. Measurements are assumed to be perpendicular to the base; therefore, the line being measured along the building must have its endpoint directly above the start point. Measurements will not be as accurate for objects that taper or lean from the base. Base to Top Shadow Height—Calculates the height of a feature by measuring from the base of the object to the top of the object's shadow on the ground. The point in the shadow must represent a point on the visible object that is perpendicular to the base. 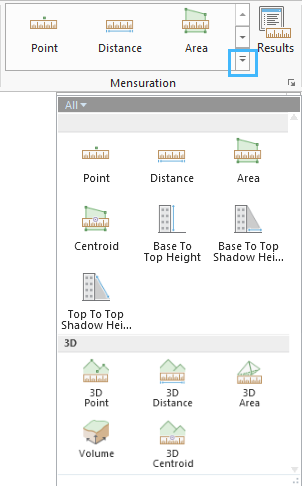 Top to Top Shadow Height—Calculates the height of a feature by measuring from the top of the object to the top of the objects's shadow on the ground. The measurement points on the object and its shadow must represent the same point. This tool is useful for obtaining the height of an object on the top of a structure, for example, if there was a smaller room than the dimensions of the building or a tower on the top. You can identify the top point of this feature in the image and identify the same point in the shadow. Specify an elevation dataset in the Mensuration Options pane to calculate more accurate distance and height measurements. Otherwise, the distance or height measurement provided is a projected distance or height, measured only using the information in the image. 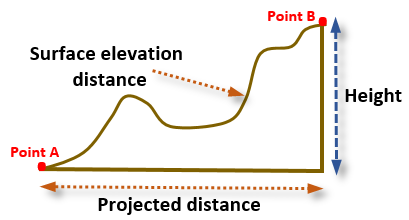 Using an elevation dataset modifies the distance measurement to provide a measurement that accounts for terrain that may have a significant influence on the measurement; otherwise, the distance provided is a projected distance, measured only using the information in the image. The mensuration tools are located on the main Imagery tab in the Mensuration group. Expand the gallery to display all the tools. The type of mensuration tools available depends on the information in the metadata associated with the imagery. Basic measurements can be performed on georeferenced imagery. Measuring the height of a feature requires a sensor model, and measuring feature height based on shadows visible in the imagery requires sun angle information in the associated metadata. The table below describes the mensuration capabilities of a raster product or the data added to a mosaic dataset using a raster type. Raster products or raster types have additional capabilities since they can have information stored in their metadata that allows the application to derive height information from them. On the Imagery tab, in the Mensuration group, click the launcher button to open the Mensuration Options dialog box. The units for Measurement Type can be chosen in the Mensuration Options dialog box. Additionally, symbols and colors for the measurement types can be chosen, and measurement accuracy can be increased by assigning an Elevation dataset using the browse button. Either an elevation file or the URL address of an elevation service can be specified. The mensuration tools provide interactive methods to measure the heights of objects in imagery. The Constrain direction of cursor movement for height measurement tools option in the Mensuration Options dialog box constrains the pointer movements when making height measurements. The three height mensuration tools operate such that the initial measurement point becomes the endpoint of a line for the constraint. The pointer will only move along the line that is appropriate for the measurement. For instance, when the Base To Top Height measurement tool is chosen, the first point should be the base of the object. The pointer movement is then constrained in the vertical direction. This is important when measuring objects where the location of the base is difficult to discern from the top of the object. For example, it may be easy to find the edge of the base of a pyramid type of feature, but difficult to determine the center of the base. There are also instances where other endpoints of the measurement are difficult to see and the constraint can assist you in identifying them. For the Base To Top of Shadow Height tool, the initial point should be the base of the feature. The pointer will then be constrained to move along the path of the shadow on the ground. The measurement constraints are a convenient way to use the height measurement tools and help you to collect correct measurements using the image's metadata. The measurement types are saved in the project's geodatabase as the appropriate feature classes. For example, point and centroid measurements are saved as a point feature class, distance and height measurements are saved as a polyline feature class, and area measurements are saved as a polygon feature class. The location and appropriate feature class type is handled within the project file, so there is no need to locate or manage these files. Measurements are saved when a project is saved, or upon exiting the project, whether or not the project is saved. 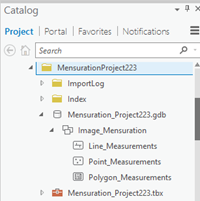 When the project file is loaded in ArcGIS Pro, the automatically saved measurements are also loaded and available for viewing or editing in the Mensuration Results pane. The measurements are linked via the attribute table of the feature class to the appropriate source image file. Changing the default location of the project's geodatabase file may cause existing measurements to disappear from the Mensuration Results pane. Measurements can be viewed in the Mensuration Results pane. You can access the pane from the Imagery tab. The Mensuration Results pane records information about all the measurements for the selected map, such as Type, Name, and Description. When you choose a particular measurement, the result for that measurement is highlighted. Additional metadata about the measurement, such as Sensor Name, Sensor Model, and Time of measurement is also displayed. You can use the tools at the top of the Mensuration Results pane to zoom to a measurement, delete the selected measurement, open the Mensuration Options pane, and filter measurements based on type. A report listing your measurements can be generated and saved. Click the Report button in the Measurement Results pane to name and save your report. All selected measurements in the Mensuration Results pane will be written to a text file. If no results are selected, all measurements for the map will be written to the report.